Sanyo’s range of camcorders more often than not fall under the Xacti line, and today Sanyo targets those who are far more adventurous than your usual birthdays, weddings, prize giving ceremonies and funeral shooting folks. We’re talking about the Sanyo Xacti VPC-CA102YL camcorder that is the perfect companion for folks who lead a much more active lifestyle than normal. This new Dual Camera is able to record your favorite memories in full HD resolution, storing more than 480 minutes of digital memories of 1080 Full HD video on a single 64GB SDXC memory card (albeit limited to a battery life of just one hour), while capturing 14-megapixel still photos. Sounds normal? How about this then – it is also capable of achieving those from a depth of ten feet underwater. Yes, you read that right, this Xacti VPC-CA102YL is waterproof up to that level of depth, which means you can also bring it with you on your next camping trip, come rain or shine, it will still keep on rolling effortlessly. Being small enough to fit perfectly in the palm of the user’s hand, you can also easily slip it into a pocket, backpack, or purse. Thanks to its utilization of the convenient video format, MPEG-4 AVC/H.264, sharing videos with friends online or over blogs is now a snap. Apart from that, all media created can also be edited and exported to portable media devices in a jiffy, and you can also hook it up to your HDTV via its Mini HDMI port to view them in full HD glory. Relying on a proprietary “double-range zoom”, it is capable of zoom operation of up to 12x while filming video, while its High-Speed Sequential Shooting mode can capture up to 22 photos at 7 frames per second. 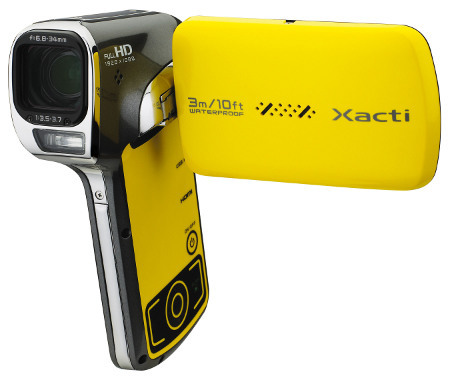 I like the Xacti line. I own a standard and the previous under water model. However when mentioning the 480mins of recording time it might be worth mentioning that battery life is only about an hour (at least thats what its is on previous models). You’re right, Brian, it maxes out at 1 hour. Guess those who bring it snorkeling will end up as prunes before the battery dies 🙂 thanks for commenting! Can you buy spare battery?